>Tsuki Japanese Restaurant: 1410 1st Ave, NY, NY. It always seems to take me the longest time to try the restaurants that are closest to my apartment. I’ve walked past Tsuki a thousand times, but never went in because I have never seen one person in there. When I passed by today, I read a few of the reviews in the window and was prompted to search further online. Much to my surprise, almost all of the sites I checked out had averages of 4 stars and glowing reviews. Tsuki, given the rave reviews is very fairly priced, and I actually had a little too much food for $23. I ordered the special sushi sampler and one piece of sushi tamago based on someone’s praise-filled review of it. The sampler was excellent. I’d say it’s not quite as high quality fish as the two others I mentioned, but the preparation is respectable and the quality is much better than what I often refer to as run-of-the-mill sushi places. 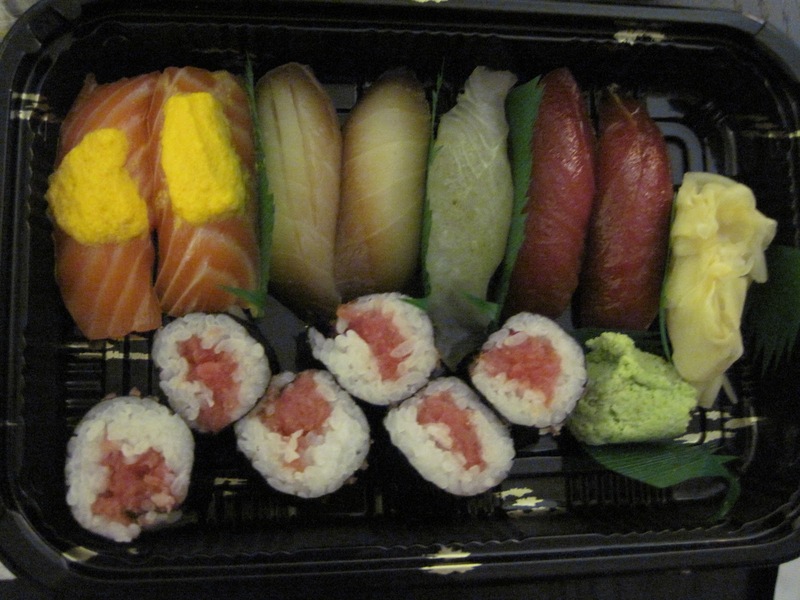 The marinated white and red tuna, fluke and salmon sushi were all delicious. The marinades complimented the fish and helped to tenderize it. I happened to really love the fluke with sea salt and yuzu, and fluke is not usually one of my preferences. 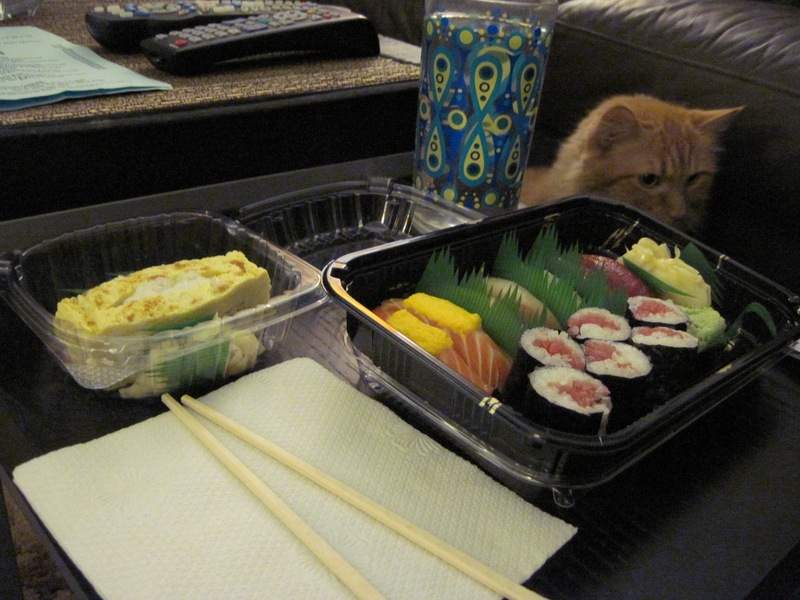 The tuna roll was pretty good, but not the best. 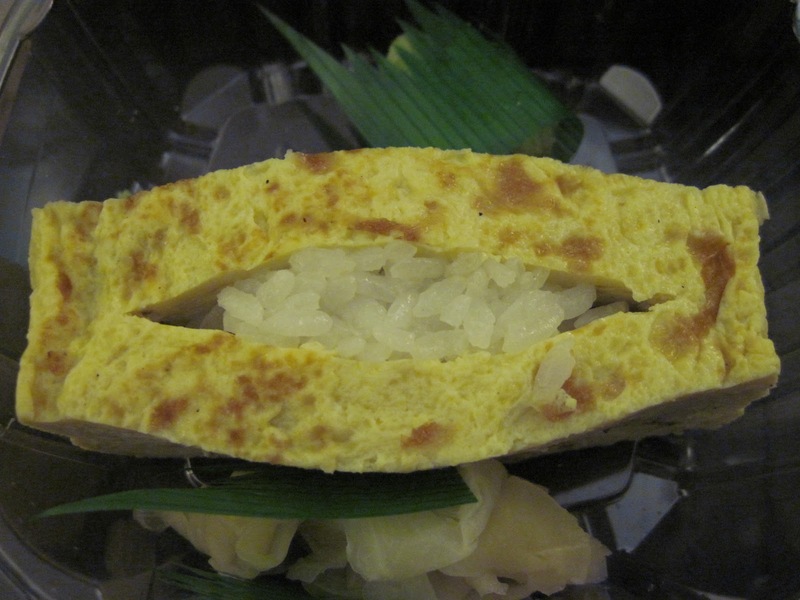 Tamago is one of my favorite Japanese treats- an egg omelette stuffed with rice, and when I took sushi classes, one of the unexpected pieces of information I walked away with is that one criteria you can judge a great sushi chef by is how well the tamago is made. Is should be pale yellow throughout with no brown. Soft and custardy, light but with a tofu-like firmness to it. You should be able to just barely make out the fine, parallel lines of the omelette’s many folds. Unfortunately, this one was way too thick, too fluffy, brown-spots throughout and not dense enough. It was, however, the only thing I wasn’t impressed with. I agree with what so many other reviewers have said; this is not a 2-roll-deal kind of place, this is a place to branch out and get the pieces the chef suggests. Don’t let the lack of atmosphere and crowd keep you away, it’s worth a visit! P.S. The delivery took less than 25 minutes. The order-taker phone person was courteous, clear and friendly….it’s the little things. Overall, pretty awesome.